(BGO) – The product of Yen Dung fragrant rice received the protection certificate for commodity's label in 2011, which is a condition to increase its value and economic efficiency. However, the rice has yet to grab the advantage. The family of Ha Van Hoat in subregion 3, Neo town, Yen Dung district (Bac Giang province) has lived on rice milling for years with a monthly estimated supply of 20 tonnes of rice to the market, including only 5 tonnes of fragrant rice. Customer buys Yen Dung fragrant rice in a store at Bac Giang city. These customers mostly are the acquaintances of the family who buy the rice for the occasion of wedding, meeting instead of using for the daily meal. “There are about 10 households with the same scale and output as ours in the neighboring communes around Neo town. 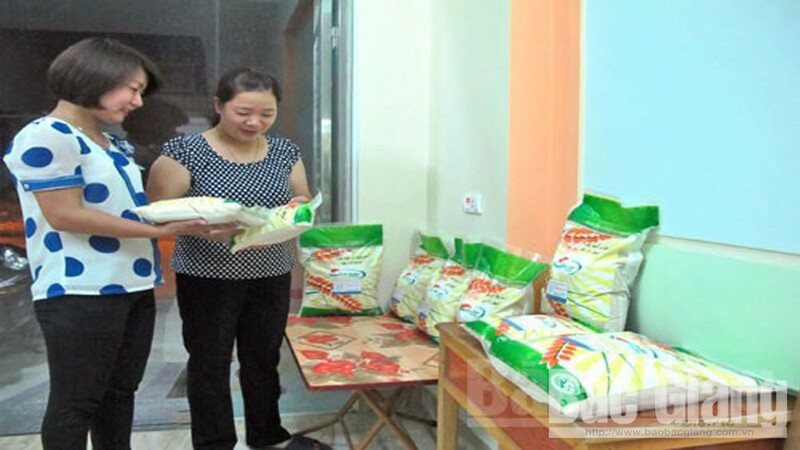 Though the fragrant rice is sold at 2,000 VND per kilogram higher price than the popular rice, each household is able to sell only a few hundreds of tonnes of rice every year”, Hoat shared. Annually, the farmers in Yen Dung district cultivate over 14,600 hectares of rice, including more than 3,000 hectares of fragrant rice with the productivity of about 16,500 tonnes. Because the grains are mostly sold to the tradesmen instead of enterprises and cooperatives with consumption linkage, the price is unstable. Besides, there is a small quantity of product labeled “Gao thom Yen Dung/ Yen Dung fragrant rice” that is normally put in the showcase or distributed at scattered stores. Few customers have approached the product due to unstable operation of the Association of the Production and Consumption of Yen Dung fragrant rice. Its members only connected to local households those live on rice milling, causing to low output and uneven rice quality. Meanwhile, the product package was not suitable because it was printed for a long time. Facing to the current situation, it is necessary for the local authority to have a general plan of organizing the operation, managing the trademark, zoning off the cultivation area, focusing on the varieties’ quality and farming procedure so as to further promote Yen Dung fragrant rice to more families, improve its value and trademark. Additionally, the cooperatives should be established as the contact point for linkage between production and consumption with due attention paid to growing the quality price toward a stable and long-term trend. SunRice team from the University College of London with its rice drying model based on Vietnam’s rice grain drying technology has won the first place of the Hult Prize competition for start-ups. Luu Bao Village in central Vietnam is famous for making turmeric-flavored rice paper for more than three centuries. (BGO)- After a bumper lychee crop with high prices, the people of Bac Giang province get in the longan harvest season. This year, the longan crop is bountiful but its price is low while the consumption has not been paid due attention by local governments and competent agencies. A Vietnamese company has won a bid to export 60,000 tonnes of Japonica brown rice to the Republic of Korea (RoK), defeating competition from rivals of China, Thailand and Australia.